How high are realtors' and lawyers' fees in Oman? What about other property purchase costs? 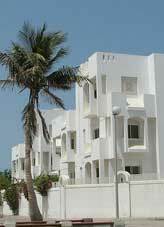 How difficult is the property purchase process in Oman? Under Royal Decree 21/2004, Gulf Country Council nationals and corporate bodies (Saudi Arabia, Bahrain, Kuwait, UAE and Qatar) are allowed to purchase constructed properties and land in Oman for residential or investment purposes. GCC citizens are allowed to dispose constructed properties at any time, but if they purchase undeveloped land, they must develop it with four years, or the government may re-possess it (with rightful compensation). Extension of the time frame is possible subject to government approval. Only after developing land can a GCC owner dispose of the property. A ministerial decision from the Ministry of Housing, Electricity and Water (Ministerial Decision 254/2004) extends property acquisition rights to expatriates in Oman, allowing them to purchase a villa as well as land in a freehold basis, but only within integrated tourist complexes. They can freely sell at any time, but as with GCC nationals, expatriates must develop any undeveloped land purchased within four years with GCC nationals, expatriates must develop any undeveloped land purchased within four years. Expatriate property owners also automatically acquire residency rights for themselves and their immediate families, by virtue of the property acquisition. In the event of deportation, the expatriate owner has the right to sell the land. Expatriate-owned land can be passed on through inheritance, upon presentation of suitable documentation. Registering property in Oman is not particularly onerous, taking about 16 days to finish the two procedures needed, and costing considerably less than elsewhere in the region. Registration fee is around 3% of the purchase price of the property. It is paid when the sales agreement is submitted to the Land Registration Department. How landlord-friendly is the law in Oman?